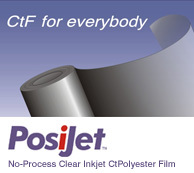 PosiJet HD (High Density) film is a high density polyester-based clear inkjet film for computer-to-film digital imaging using recommended inkjet printers. It is ideal for pleasing full-colour & screen positives in any size, with unbeatable value-for-money. PosiJet HD film is designed to produce high-resolution instant-drying four-colour plate-ready positives in 2, 4 and 8 page formats, with UV density matching silver-based films. PosiJet HD can also be used for generating negatives. However, the ink consumption is significantly higher than that for making positives. When imaged on high-resolution pigment-based inkjet printers (e.g. Epson Stylus Pro 700 / 900 series), the patented ink-receiving layer ensures excellent reproduction of 2 - 98% dots at 2880 dpi, micro-fine lines and perfect solids. PosiJet HD offers the lowest cost computer-to-film solution, ideally suited for commercial printers, newspapers, book & magazine publishers, screen printers, flexo printers and several other applications currently using expensive silver-based films. Specialised layer for good ink acceptance ensuring higher Dmax and at the same time ensuring Instant Drying. 1, 2, 4 & 8 page format capability with excellent registration accuracy. Matte grain surface to ensure good vacuum and excellent image transfer, it also prevents sticking on exposure and ink transfer. Single, spot & pleasing full-colour reproduction capability. Excellent dot sharpness and solid black reproduction. Totally dry Computer-to-Film-to-Plate process. No Camera. No Darkroom. No Imagesetter.No Platesetter. No Processor. No Chemistry. No hassles! Design the job using standard DTP software. Image the film using the recommended inkjet printer. Expose & process the plate or screen using the PosiJet HD positive film.